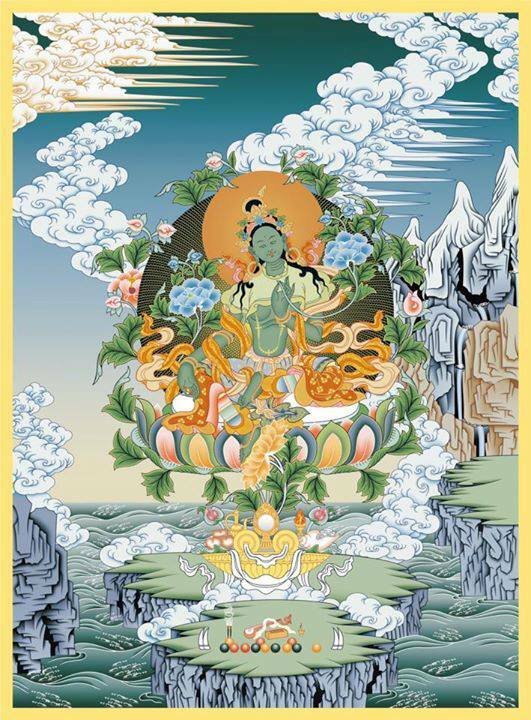 A Bodhisattva is one who has decided to walk the path of Awakening in an effort to help all beings. The path is a long and selfless mystical journey that involves cultivating generosity, patience, virtue, diligence, meditation, and wisdom. Full of compassion for others, bodhisattvas make the vow to embody the path and guide anyone that seeks it. The word “bodhisattva” literally means “a being who is seeking awakening.” A bodhisattva is one who is seeking Enlightenment, helps others seek Enlightenment, and cultivates virtue and wisdom. Bodhisattvas strive to benefit both themselves and others in the mystical journey. Bodhisattvas make the vow to strive to free all beings from suffering. When we make these vows, helping and liberating others becomes a responsibility. The mind of the Bodhisattva is said to have three elements. They are: the aspiration for awakening, great compassion, and skillful means. The aspiration for Awakening is the mind seeking Enlightenment. Without this aspiration, we have no motivation on the path. If we have no motivation, then it will be difficult to persevere. 1 Sentient beings are limitless, I vow to liberate them. 2 Afflictions are endless, I vow to eradicate them. 3 Teachings are infinite, I vow to learn them. 4 Buddhahood is supreme, I vow to attain it. If we lose our aspiration for Awakening, then it will be difficult to bring benefit to anyone. Aspiration for Awakening is the root of the path. Great compassion is the part of our mind that wishes to help all beings. When a bodhisattva wants to help others, they must do so with a mind of great kindness and compassion. A bodhisattva can use kindness to bring others joy and compassion to remove suffering. When a bodhisattva helps others find the path the do not seek anything in return. Instead, they see helping others on the path as a responsibility. This is true compassion. Skillful means represent the different tools we use in the path to Awakening. These include things like meditation and chanting. A teaching that I like is called the four means of embracing. These are: giving, kind words, altruism, and empathy. These are some of the tools we can use on the path to Awakening. Buddhism places great emphasis on the cultivation of wisdom, but it also places great emphasis on ethics in life. After he Awakened the Buddha said, “Do nothing that is harmful. Do only good, and purify the mind.” It could be said that all Buddhist teachings can really be summarized in that small sentence. Following the path of the Bodhisattva is a way of cultivating our selves. It is a path of self improvement that benefits everyone around us, as well as ourselves. The most important teaching for walking the bodhisattva path is the six perfections. The six perfections free us from delusion and lead us to Awakening. They are forms of practice for us to cultivate in order to live more awakened lives. I’ve written about the six perfections before, but I will summarize them briefly here. The Perfection of Generosity: to give without any attachment to form. To give with no attachment to what is being given, who is giving, or who is receiving. The Perfection of Virtue: To respect and not harm others. Observing Buddhist precepts and acting in accordance with human values. The Perfection of Patience: Facing life with a sense of equanimity that allows us to endure what is difficult to endure. Practice patience by being tolerant, accepting, and by spending time contemplating truths. The Perfection of Diligence: This is our vigorous desire to practice ceaselessly, to bring joy and benefit to others even when it is difficult to do so. The Perfection of Meditation: This is our cultivation of mindfulness. This helps settle and focus ourselves. The Perfection of Wisdom: This is our cultivation of insight. This represents our work in understanding the non-duality of existence. When we cultivate this wisdom then we truly can inspire others on the path. The six perfections are powerful. When we cultivate them we are spreading the teachings of the Buddha and bringing great benefit to ourselves and others. These are good things to do: cultivating the six perfections, generating compassion, aspiring to Awaken. When we do these things, we are unleashing the Bodhisattva within.